One of my Rules of Pub is: never drink in a pub with a flat roof. It’s a rule with a sub-clause. The sub-clause is: except the Criterion. Five minutes ago my bandmates and I were getting off a train at Leicester station and tumbling into a taxi. Now we’re standing at the bar in the Criterion. In five hours’ time we’ll be on stage. We know we need to go steady on the ale. When the ale’s this good, that’s a big ask. I’ve asked for a little taste of one of the beers, but both the bar staff have disappeared before we can go on and order. After some time they re-emerge, each having supposed the other had been serving me. We’ll discover later that they’re understaffed today, these two people doing the work of four. With one room already full of football fans, and a second, quieter room filling up steadily, they’ve got that work cut out alright. And it’s not just the beer they have to worry about serving. We’re here for lunch too. We’ve chosen this place not only because it’s near the gig venue, and not only because of its excellent beer. The Criterion is renowned for its pizza. Rather than offering a broad range of mediocre meals – as so many other pubs do – the Criterion specialises in one kind of food, and does it spectacularly well. It’s a unique selling point – or, without my marketing head on, another reason to go out of your way to come here. The three of us sit with a couple of friends from Nottingham, Damian and Kerry, who we’ve just bumped into. We’re all here for the Leicester Indiepop Alldayer round the corner at Firebug. As with many other gigs, we’re starting off somewhere other than the gig venue because the beer is better. We settle to a natter, and sunshine streams in to fill the room with optimism in a way that only March and April sunshine can. From about ten draught beers, we’ve chosen Citra, from Oakham Ales. It’s so dry and bitter that at first it feels like a slap round the chops with a bag of lemons. Then your taste buds adjust, and it’s just refreshing and full of pretty springtime flavours. Plenty of these beers are from breweries I’ve never heard of, which is also refreshing. But we find familiarity in the label clips lining the tops of the walls, grouped by brewery. With a Wentworth wall, an Acorn wall, and an extensive Abbeydale section, we South Yorkists feel plenty at home. The pizzas arrive: one with goats’ cheese, olives and artichoke for the vegetarians in the band, and one with chicken for the drummer. It’s not just good pizza – it’s superlative. Far better than you’d get in most high street Italian restaurants. We can’t order another one because of the short-staffing, but the manager takes the trouble to come to our table with explanations and apologies. Time ticks on towards pop o’clock, and at length we take ourselves over to Firebug (where I finally accept that a crisp bottled lager like Tiger beats a woody old-school ale like Pedigree when the latter is coming out lifeless and warm). But if we weren’t due on stage we’d happily stay in the Criterion all day, or possibly all weekend. The ‘pubs with flat roofs’ rule? Well, it’s a bit tongue-in-cheek, of course. I guess it’s a reference to the stereotype of basic boozers on bleak estates, where you might think you’ll be lucky to escape with nothing worse than a few funny looks. In other words, the idea we have of pubs at their worst – insular and complacent, dispensing low-quality product to undiscerning and unfriendly locals. In fact this is the sort of nonsense spouted about pubs by misanthropic Little Englanders who haven’t actually stepped into one since 1983. And anyone who spouts it ought to come to a place like the Criterion and learn. We’ve come here today from Sheffield and met up with friends from London and Nottingham before the popshow. 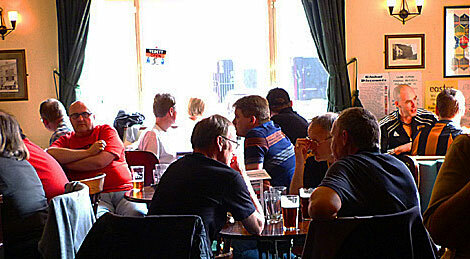 In the other room fans of Leicester and Hull are mingling before the football. For two or three hours the Criterion has been a marvellous little hub where people from different places, on different tracks, can happily intersect and interact. This isn’t pubs at their worst: it’s pubs at their very best. You did well dragging yourselves away from there. There are certain pubs and the Criterion is clearly one of them that you can find yourselves settling into for limitless hours. Rutland Arms in Sheffield always does that to me, as does the Ship and Mitre in Liverpool and the Angel in Leeds, and so on. Credit to your willpower! I had that very citrussy Oakham one the other day. It’s a beer you have to (you *have to*) have at least two pints to get used to. This rule excludes the Laurieston, which in turn excludes you from ever visiting Glasgow ever again. New sub-clause appended with immediate effect!